The school is a charter school offering education for grades K-12. It is in Broomfield CO and focuses on smaller classes so that students and teachers have more time to interact. 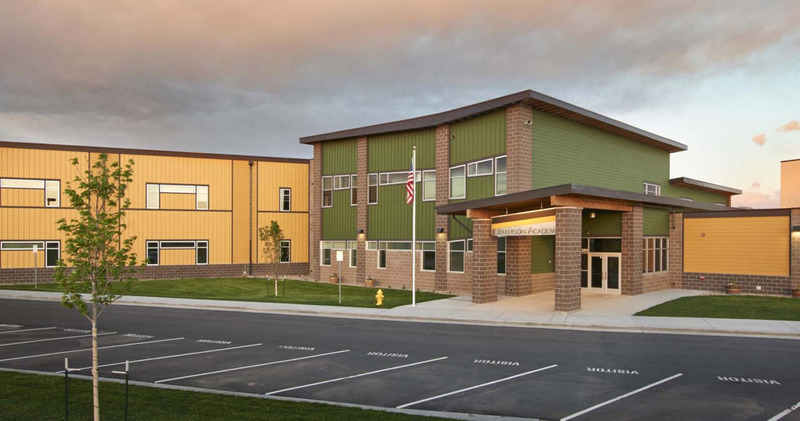 The Jefferson Academy project is a two-story, mostly wood framed school building. Both levels are above grade with no plan for any below grade space. There are three sets of stairs and one elevator for vertical transportation. The building has a flat roof with drainage slope achieved by sloping the structure in one direction and using over-framed or tapered insulation crickets. The building footprint is approximately 41,000 gross square feet. The main level has a gymnasium, locker rooms, a weight room, a commons, admin., music, drama, LMC, art and general classrooms. The second level has the senior commons, teachers’ lounge, computer room, science rooms and general classrooms. Both levels have support spaces such as electrical rooms and custodial closets.